Cook the moong dhal with 1 cup water in a pressure cooker. Cool and mash it. Keep aside. Heat the coconut oil in a kadai. Add the mustard seeds and let them splutter. Now add the cummin seeds, asafoetida and fenugreek. Add the onions, curry leaves, green chillies and saute for 2-3minutes. Add all the vegetables and saute for another 2 min. Add the turmeric powder, chilli powder and coriander powder. Saute for 2-3minutes. Add 1/2cup water and allow the vegetables to cook. Keep the lid on. Add salt and mashed moong dhal. Add 1 cup water. Bring it to boil. Remove from flame. Squeeze lemon juice and jaggery. Mix thoroughly. Garnish with coriander. 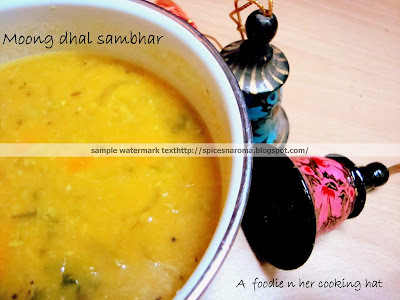 Serve the hot sambhar with idly/dosa/pongal.